Else Young, left, 102 years old, accepts an Ohio Women Making a Difference Award on Saturday in Cincinnati on behalf of the Marching Mothers of Hillsboro. They have been inducted into a halls of fame, had a movie made about them and been parade grand marshals, and this past weekend the Marching Mothers of Hillsboro received the Ohio Women a Making a Difference Award from Ohio Senator Sherrod Brown’s office at Xavier University’s Cintas Center during the Ohio Women’s Leadership Summit. The award was accepted by 102-year-old Hillsboro resident Elsie Young. ”This year’s theme of our annual Ohio Women’s Leadership Summit is how we can all make a difference in our communities – and every Wednesday until the conference, we’ll highlight an Ohio woman who’s doing exactly that,” Brown said in a recent news release. “These women have all found new and different ways to make change in their corner of our state, and some of them will even join us at the summit in October. “For our first Ohio Women Wednesday, learn about 102-year-old Elsie Steward Young – a legend in Southwest Ohio, and a lifelong fighter for justice and opportunity for Ohio children. “In 1954, after the landmark Brown v. Board of Education case, the two all-white primary schools in Hillsboro refused to integrate, and the district continued to send black students to the one all-black school. The goal of the summit, according to the news release, was to shine a light on the good work women are doing in southwest Ohio to uplift their communities. In 1954, Hillsboro High School had already integrated, but there were two all-white elementary schools, Webster and Washington, and one all-black school, the Lincoln School. The Lincoln School was about 85 years old at the time and in bad shape. A group of African-American mothers, led by activist Imogene Curtis, began talking over the back fences as they hung out their laundry and decided they no longer were going to send their children to Lincoln. Meanwhile, the county engineer, Phillip Partridge, had long believed segregation was wrong and that the Lincoln School was not fit for the children. On July 5, 1954, he broke into the school and set it on fire in an effort to end segregation. Not wanting the black community to be held responsible for the arson, Partridge later turned himself in and was jailed. Despite the fire, the Hillsboro Board of Education voted to repair the damaged school in lieu of integrating. On Sept. 9, 1954, Imogene Curtis, along with Gertrude Clemons, Selicka Dent, Elsie Steward Young, Sallie Williams and others, led about 50 children to the elementary schools, but were denied entrance. The school board had also made the decision to designate new school zones, clearly taking the sections of town where the black community lived and saying that those areas were the Lincoln School zone, making some students walk past Washington Elementary to get to Lincoln. The mothers continued to bring their children to the elementary schools each day, only to be turned away. This began a two-year ritual – each day the Marching Mothers and their children walking to school and being sent home. Aided by the Dayton NAACP, on Sept. 22, 1954, Gertrude Clemons, Roxie Clemons, Elsie Steward, Norma Rollins and Zella Mae Cumberland filed suit against the Hillsboro School Board and Superintendent Paul Upp for an injunction against the rezoning, stating that it prevented their children from attending a white school. Thus began a long court battle for integration. The Hillsboro fight for integration caught the attention of the NAACP’s Thurgood Marshall, who had successfully won the Brown v. Board of Education suit. Marshall sent New York NAACP attorney Constance Baker Motely to Hillsboro to argue the Hillsboro case in the courts. This was the first northern test case of the Brown decision. Young Joyce Clemons, daughter of Gertrude Clemons, was chosen to be the child litigant in this case. The case dragged on into 1955, and the Lincoln Mothers and their children continued to show up at school each day, only to be sent home. Although some parents chose to continue to send their children to Lincoln, the remainder of the children were taught in the homes of the Lincoln School Mothers. Quaker teachers from Wilmington College started coming to Hillsboro to assist the mothers each week. On Oct. 19, 1955, a cross was burned on the lawn of the Blakely family, a family participating in the march. Many believed the Ku Klux Klan was responsible. However, the marchers were not deterred. By the spring of 1956, the case had gone back and forth from the U.S. Court of Appeals, 6th Circuit and even to the Supreme Court. The Supreme Court refused to hear Clemons v. Board of Education of Hillsboro on April 2, 1956 and rejected Hillsboro’s further attempt to block integration. After the Ohio Board of Education threatened to withhold all state funding, a majority of the Hillsboro school board voted to integrate. By April 17, 1956, 11 black students attended Webster Elementary. By the fall of 1957, nearly three years after Imogene Curtis began the fight for equal education, Hillsboro elementary schools were completely integrated. On Aug. 26, 1957, Lincoln School, located on the site where Samaritan Outreach Services stands today, was sold by the Hillsboro school board. The efforts of the Lincoln School Mothers – Della Blakey, Gertrude Clemons, Glea Clemons, Roxie Clemons, Dellia Cumberland, Zella Mae Cumberland, Zora Cumberland, Francis Curtis, Imogene Curtis, Selicka Dent, Alberta Goins, Alberta Jewett, Norma Rollins, Minnie Speech, Maxine Thomas, Sallie Williams, Elsie Steward Young, Joanne Zimmerman and Nellie Zimmerman – helped not only end segregation in Hillsboro, but their efforts and sacrifice helped end segregation in other northern cities. 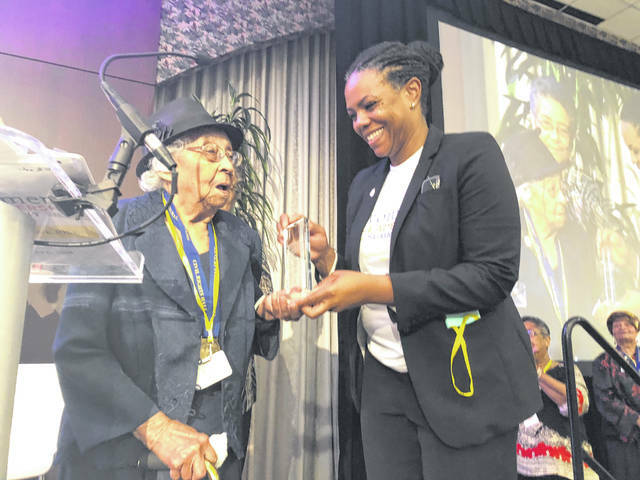 https://www.timesgazette.com/wp-content/uploads/sites/33/2018/10/web1_Marching-Mothers.jpgElse Young, left, 102 years old, accepts an Ohio Women Making a Difference Award on Saturday in Cincinnati on behalf of the Marching Mothers of Hillsboro.